A tenth rhino has died after being moved to a different Kenyan national park, the government said, as it announced the results of investigations into previous deaths. Autopsies found the water at the endangered black rhinos’ new home, Tsavo East National Park, was too salty and harmful to them. They were taken there in an attempt to start a new rhino population. Eleven rhinos were moved. The survivor was injured in a lion attack. Estimates suggest there are fewer than 5,500 black rhinos in the world, all of them in Africa and some 750 in Kenya. Eight of the animals that were moved came from Nairobi National Park and a further three from Nakuru National Park. After the first eight rhinos died, the government announced an investigation led by the Directorate of Criminal Investigations. Speaking at a press conference, Tourism Minister Najib Balala confirmed the initial belief that water with a high concentration of salt at Tsavo East had harmed the rhinos. Before the government moved the rhinos, samples of the water had been taken but the results were not considered, he said. 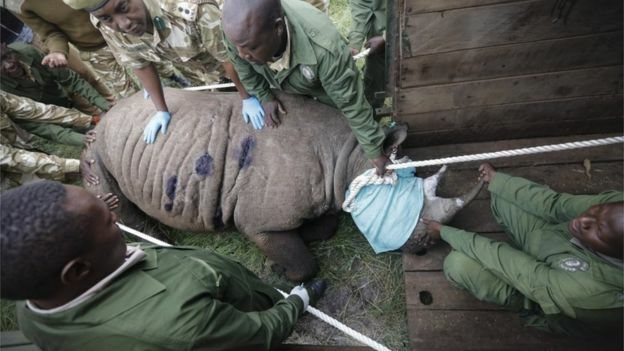 The rhinos that were examined had died from dehydration, upper respiratory tract bacteria and gastric ulcers, he added. The minister blamed government officials for negligence, poor co-ordination and poor communication which caused the deaths. 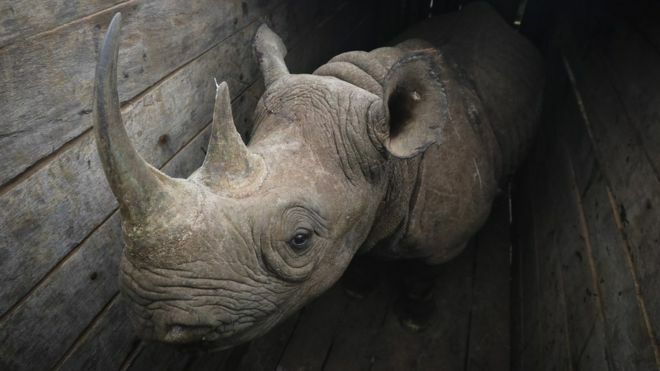 A total of 14 rhinos were earmarked for the move, but the government cancelled the transportation of a further three from Nakuru after the first deaths. Rhinos are often moved when their populations outgrow their surroundings. In the case of critically endangered black rhinos, the moves can establish new breeding habitats to boost numbers. Nine rhinos were killed in Kenya last year, according to KWS, and in March, the world’s last surviving male northern white rhino died after months of poor health. He had previously joined the dating app Tinder to raise funds for his conservation.